Dog trainers hear it all the time: “My dog is great at home, but as soon as we get around other people/pets, his manners go out the window!” Keeping a dog calm and attentive in public goes against their natural instincts to explore and interact with their surroundings. Disruptive dogs can become well-mannered members of polite society, but it takes lots of practice and plenty of patience on the part of the owner. 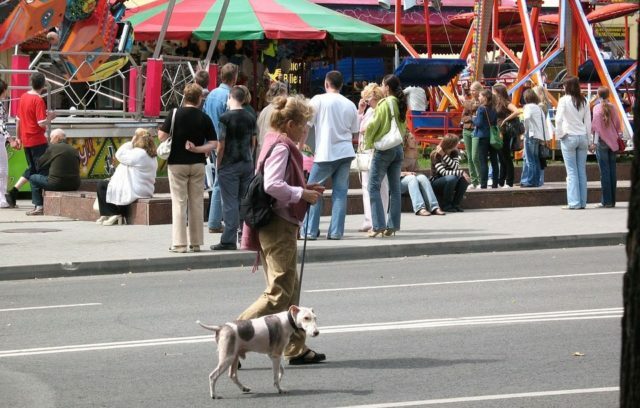 Why do some dogs act unruly in public? A trip to a busy pet store with a dog is similar to visiting Disney World with a child. Absolutely everything is new, exciting, and appealing. Their senses are flooded with enticing sights, distracting sounds, and countless irresistible odors wafting from all directions. Just as children can be taught to behave in the Magic Kingdom, dogs can learn to control their excitement at PetSmart. On the other end of the spectrum there are fearful dogs that become completely overwhelmed when faced with a busy social setting. Dogs of any age, breed, or size can suffer from anxiety in the presence of new people or places. For some this manifests as aggression, while others simply shut down; cowering, shaking, and refusing to walk. Many owners assume their fearful pup suffered some kind of abuse or trauma, but their behavior is more likely caused by a lack of socialization during a critical phase in their puppyhood. However, fearful adult dogs can be rehabilitated, so don’t let a shy demeanor keep you from adopting a rescue dog. What can you do to keep your dog calm? As stated above, socialization is extremely important to the emotional development of young puppies. Exposure to all manner of stimuli by four to six months of age will help prevent the development of anxiety and phobias. If you have adopted a puppy, desensitization training is just as important as updating his vaccines and choosing a healthy diet. Once your veterinarian gives you clearance, begin visiting public parks, pet-friendly stores, and puppy kindergarten classes. Some dogs are born ambassadors and will march up to strangers right off the bat. Others will need more time to slowly build up their tolerance and trust. If your pup is having trouble adjusting to the various sights, sounds, and smells of the world outside your home, contact a professional trainer for help. Provide plenty of exercise before heading out in public. 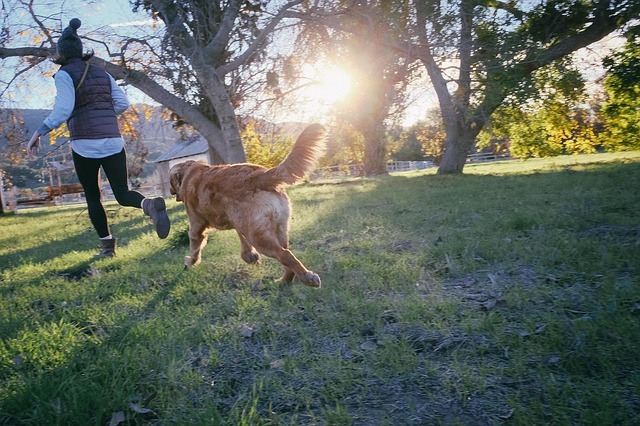 Exercising your dog before hitting a popular hiking trail may seem counterintuitive, but as the saying goes: “A tired dog is a good dog.” Pent-up energy could manifest as unruly behavior, anxiety, or even aggression. Set your dog up for success by tiring him out with a game of fetch or 10 minutes on the treadmill. You’ll be amazed what a bit of cardio can do when you are working to keep your dog calm. Use a secure collar or harness that gives you maximum control. There are several options when it comes to choosing your dog’s collar, and/or harness. Excitable or fearful pups should be fitted with items that will not slip off or become dangerous in a struggle. You should also choose products that give you maximum control in any situation. Martingale collars are designed to tighten when a dog pulls against the leash, but are safer and gentler than “choke” collars. Because they fit snuggly, they are less likely to slip off than traditional collars. In fact, many professionals recommend them for dogs in training. Head halters or Gentle Leaders are another popular option. They loop around your dog’s muzzle and buckle at the back of the head. When the dog pulls or veers off course, the loop tightens down on the muzzle, matching their energy. While head halters are generally considered safe, there have been reports of neck injuries in particularly unruly dogs. A harness may be a better choice for some dogs. Good-quality harnesses distribute pressure across the chest rather than the vulnerable neck and throat. They also give you more control if your dog lunges or jumps up on people. No matter which collar or harness you choose, always keep your dog on a sturdy four- or six-foot leash. 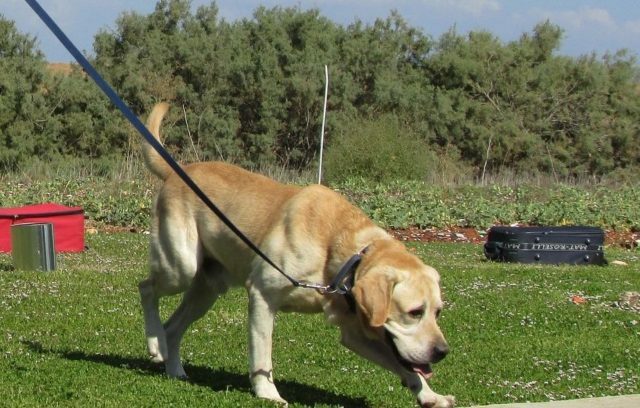 Retractable leashes give dogs far too much freedom and reduce your control. I don’t know about your dogs, but mine snap to attention in a hurry when the treat bag appears. When working on keeping your dog calm in public, you need something that is sure to keep his focus on you. Choose treats that are irrisistible to your pup – like bits of cooked chicken breast – rather than his everyday snacks. Previous training such as the “heel” and “watch me” commands can easily go unheeded in distracting situations. 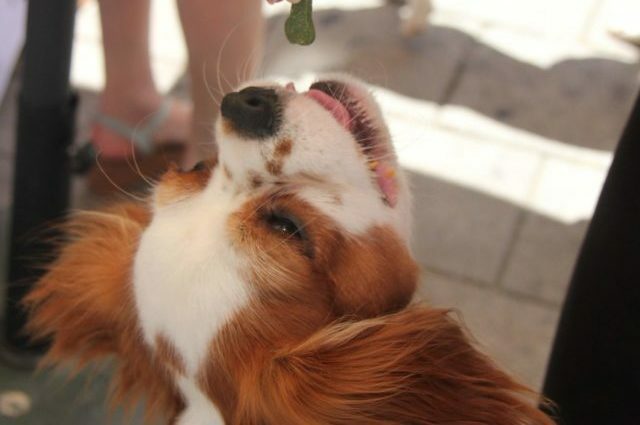 High-value treats give your dog an extra incentive to focus on you and obey your instructions. Make sure you project calm energy. Dogs are incredibly intuitive. When it comes to our emotions, they can read us like the funny pages! Nervous owners tend to have stiff body posture and cling tightly to the leash in anticipation of trouble. 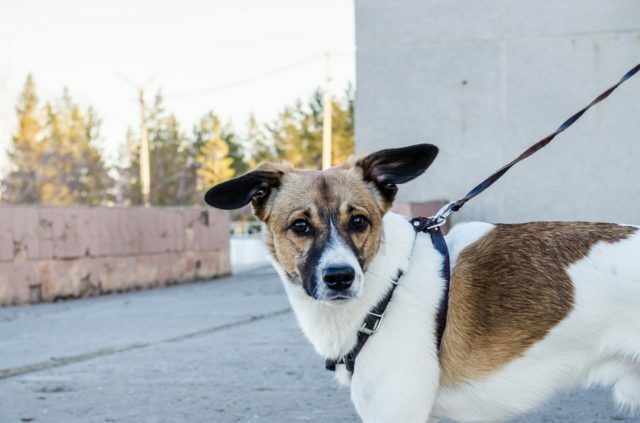 In these situations, the leash becomes a live wire, with your tension traveling right down into your pooch. Instead, work on projecting a calm, confident energy. Your dog will sense it and feel more relaxed himself. No dog becomes a perfect member of society overnight. If you are feeling overwhelmed, consider group training classes or working one on one with a professional trainer. 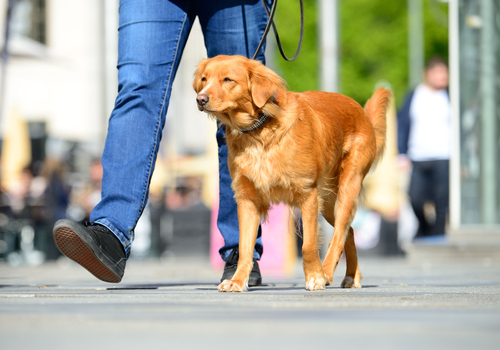 With practice, patience, and consistency, keeping your dog calm in public will soon begin to feel like second nature.